The P.T. 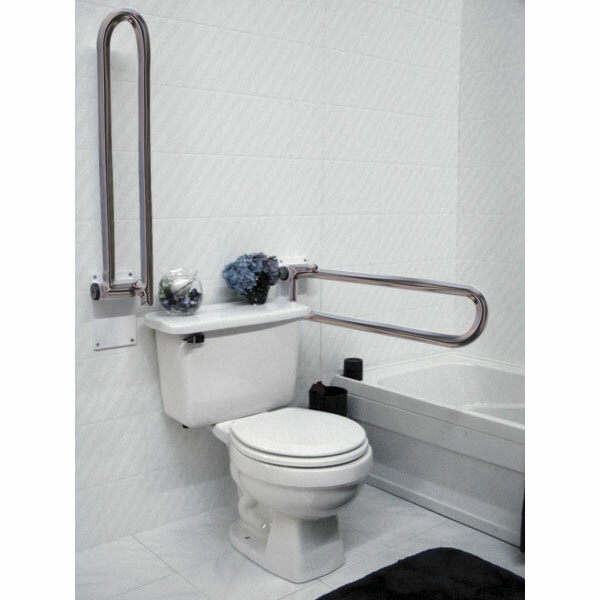 Rail is a wall mounted support rail which promotes safe standing and transfers to and from a toilet. Combines an exceptionally solid feel, and an innovative offset rail design. Secure - P.T. Rail provides rigid support where it is needed - on one or both sides of the toilet. This model is to be attached to the left side of the toilet. 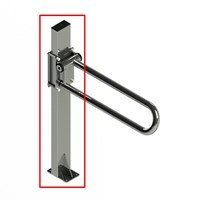 No wrist strain - Unlike vertically aligned dual rail systems, our unique offset rail design prevents wrist strain when using lower rail. Safe, out of the way storage - our hinged models fold up to store out of the way, yet pulls down in a instant when needed. Smooth fluid feel hinge holds its position wherever you leave it - even halfway up - it will not inadvertently fall down causing impact injuries. Rail Length: 28 / 71 cm from wall to tip of rail. Rail Diameter: 1.5 / 3.8 cm diameter. ADA Compliant. Rail Offset: 6 / 15 cm vertical offset. 1.5 / 3.8 cm horizontal offset. Rail Material: Stainless steel. Brushed satin chrome and alloy steel with white baked enamel finishes also available. Wall Plate: 5.5 x 9 / 15 x 23 cm with fastener holes (3/8 diameter). Weight Capacity: 350 lbs / 159 kg. Note: The P.T. Rail should only be installed in areas where the mounting surface is structurally sound. If you are not equipped to undertake the outlined work we recommend that you have your P.T. Rail installed by a qualified contractor. The P.T. Rail, ( or P.T. Rail Floor Mast System) must be secured to wall (or floor) with fasteners appropriate to the structural material. Fasteners must be rated for certain retention force each for maximum weight capacity (see within for recommendations). Mounting fasteners should be inspected monthly and tightened if necessary. Rail is capable of supporting a maximum suggested user weight of 350lbs/160kg. Note: Due to variances in needs, materials and local construction methods, the information contained within concerning mounting location, fasteners and wall fabrication is provided as suggestion only. Consult the appropriate local professionals for best advice.